The Woodway Not a Boat Launch is Now a Boat Launch Again! 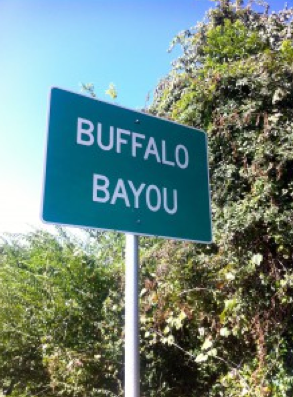 Yes, the best access to the most beautiful and historic natural stretch of Buffalo Bayou is now open to the public again. The Woodway boat launch, an official Texas Parks and Wildlife paddling trail takeout, is located in the Old Archery Range of Memorial Park. The entrance, hidden behind locked construction fencing for the past three years, is on the south side of Woodway just west of Loop 610. There is ample parking for vehicles and trailers and easy access on a sloped ramp down to the bayou’s edge. Well, except for the thick mud at the bottom of the ramp. This former nature area and boat launch was closed to the public for nearly three years, and during that time paddlers had to make do by putting in under the Woodway Bridge. And just in case the gate to the recently reopened boat launch is locked (we’ve heard reports), here is how you can still launch your boat by going underneath the bridge. To park, cross the bridge going west, stay in the right hand lane and park in the small parking lot immediately on the right, west of the bridge on the north side of Woodway that seems to be a utility area paved with permeable bricks. Normally we unload canoes and kayaks beforehand on the north side of the bridge just east of the bayou in the grass next to the green Buffalo Bayou sign. Looks daunting, but it’s done. Be bold. Drive on the grass. Or hire paddling expert, naturalist, and geologist Tom Helm for the best, most informative river trip. The entrance is just a little sliver of a hidden passageway between the vegetation and the bridge itself. You have to slip and slide yourself and your equipment down the slope under the bridge and put in there. Note the mud bulldozed up under the bridge and dumped there from the “erosion control” project, previously the canoe launch. Landscape and architectural design allegedly by SWA Group. Somehow SWA or the Parks Department or somebody forgot to include access for the public in the design, which is why the newly landscaped $1.3 million project is still was closed to the public as of until Nov. 3, 2014 Oct. 17, 2015, Dec. 24, 2015, even though it was finished [a year ago] last in the spring of 2014, according to Sarah Newbury of the Uptown TIRZ (Tax Increment Reinvestment Zone) 16. See below for takeout options. Be sure to check the water level and flow before you go. Base flow is very low, slow current at about 150-200 cubic feet per second. After a storm, the Army Corps of Engineers will release impounded rain water from the dams in west Houston, which are undergoing repairs, and the current can be fast and dangerous. There are also pipelines and downed trees in the bayou, so watch out. The bayou always looks different; it’s a living thing and always changing. But it especially looks different at high or low water. Do try to note the difference between deposition of sediment and subsequent slumping or erosion of deposition, and slumping (caving) and erosion of the high banks from the top (runoff). The magnificent and steep high cliffs that you see are tens of thousands of years old—not the product of recent erosion, as so many mistakenly think. We have these great cliffs, called Meander Belt Ridges, on all our west-east flowing streams in the Houston area. You can also put in at the railroad trestle inside the park—if they don’t decide to block that off too. (Update: Access to the railroad trestle apparently has been closed. Vehicles reportedly are no longer allowed to drive down the dirt road easement alongside the railroad tracks to the bayou.) There are some small rapids at the railroad trestle and the most beautiful part of the bayou begins here. Drive around to the south of the new running center and Memorial Park Conservancy headquarters. (Note the non-native plants in the new landscaping—and we thought they were so concerned about the park woods being so filled with non-native species!) At the end of the service road towards the bayou it gets steep and very rutted. But it’s a lovely if challenging spot. The wildflowers and grasses are delightful. Have a good time. The most beautiful part after the railroad trestle is perhaps because there is less heavy disturbance opposite the park. But all that you see on your left after Woodway is public parkland. Even the beach in front of private homes downstream of the park is public land owned by the Harris County Flood Control District. The banks downstream from those houses all the way to just past the Bayou Bend Collection footbridge are also public land, owned by the City of Houston as part of the Hogg Bird Sanctuary. The proposed Harris County Flood Control destruction project begins about a 45-minute paddle (depending on the current) downstream from Woodway at a sharp left-hand bend with a kind of picket or snow fence and a young sycamore tree on the right or south side where the River Oaks Country Club golf course begins. (This young tree and associated riparian vegetation have since been destroyed by the installation of environmentally-damaging riprap by the country club.) Note the golf course on a steep bank above. You may see a handrail and golf carts going by. The erosion that you see on the upper banks is caused by the destruction of vegetation on the once-forested high bank and the mowing of grass planted to the edge. (Mowed grass cannot grow roots long enough to hold the soil in place.) On your immediate left will be a sloping sand bank belonging to Memorial Park. Please be aware that this south bank area was healing before the club killed the vegetation on the upper high bank in September 2015. That happened during the process of spraying all the grass on the golf course in preparation for redesigning the course, a renovation project that fortuitously coincides with our mostly publicly funded project to turn their bayou front property into grassy, sloping banks. The limits of the destruction project area are the golf course on the south or right-hand side. So as soon as you no longer have the golf course on your right, you are out of the project area. You will see that the club has also installed riprap along this denuded stretch of the bayou also, and plans to install more. Riprap damages the bayou’s ecosystem by increasing the velocity of the water, causing greater erosion and flooding and by preventing the bayou from healing and replanting the vegetation necessary for cleansing our water, turning sand into soil, and preparing the way for new riparian forest. 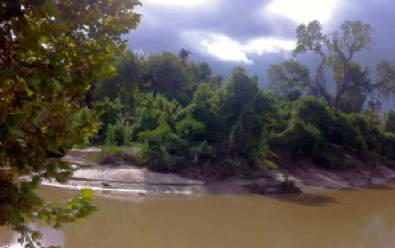 The erosion and slumping, along with the brush and trees lying on the banks, may look like damage to those unfamiliar with the natural process of a dynamic river. But the bayou is constantly adjusting and rebuilding itself. It’s a healthy process. Here we are fortunate to have room for the river to move. The brush and trees will collect sediment and restore the banks, and provide habitat for wildlife. Even steep, sheer banks are necessary for nesting birds like kingfishers and protect them from climbing predators. Stop and spend some time in what we call the middle meander—a lovely sandy marsh on your left and a sandy point on the right at a sharp bend with cliffs directly ahead of you. Note a sycamore tree with a cut trunk on your left. This is the eastern (downstream) limit of Memorial Park. The bayou here will be plugged and filled in, the thousands years old cliffs defaced and graded, and the bayou rerouted much further south into club property. An abomination. We should be respecting the cliffs—our ancient geologic heritage. Just downstream from Memorial Park is the Hogg Bird Sanctuary, which is also a city park. But despite the listing on the Texas Parks and Wildlife Buffalo Bayou Paddle Trails map, there is no boat launch in the sanctuary, and paddlers should be respectful of this nature preserve. However, there is a sometimes difficult takeout point on Harris County Flood Control District land immediately downstream of the Bayou Bend Collection footbridge. It’s on the eastern side of the Bayou Bend parking lot. Look for a narrow, sandy, sometimes muddy beach on your left just a few yards downstream of the busy footbridge. It’s a short, steep, slippery hike (remember the bayou is always changing) up to the large parking lot. Do note that the fenced parking lot is open only from 10 a.m. to 5 p.m.
We used to take out after the Shepherd Bridge. You could park your pickup vehicles on the small side road just north of Memorial Drive, west of Shepherd below De Pelchin home. To pick up the boats from there we would drive east on Memorial right over the curb and over the grass into the park on the north side of the bayou just east of the Shepherd Bridge. But Buffalo Bayou Park has changed. Driving into the park may no longer be possible or even legal. Best to continue on. Which means paddling all the way to the boat launch hidden under mud near Elanor Tinsley Park on the south bank (modest parking available some 200 yards away) or to the next takeout buried under mud at Lost Lake below the Dunlavy also on the south bank (parking available). Or paddle even further just past the Sabine Street Bridge and use the takeout on the north bank where there is ample parking in the lot of the Fonde Recreation Center. (All of this is mapped on the TPW Paddling Trails map.) 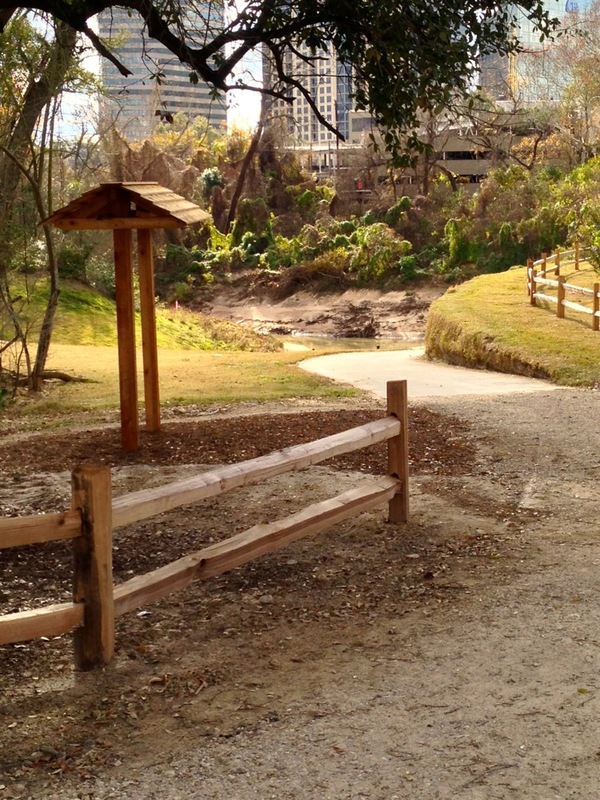 You will notice the contrast between the landscaped Buffalo Bayou Park and the banks of Memorial Park. For the record, there’s an unusable takeout slightly further downstream from Sabine on the south bank with no parking whatsoever. Difficult to know what planners were thinking there. Do it and have a great time! It’s amazing. And sad.